As the old joke has it, the way to eat an elephant is one bite at a time. Although the joke relies on a clearly absurd premise, there is a lot of truth to it: any big task is best handled one piece at a time. Whether you’re talking about sending a man to the moon, digging the Panama canal or your own battle to lose weight, the biggest jobs all rely on many small steps toward an ultimate goal. In fact, if we take the phrase “one bite at a time” literally, we have what is perhaps the most effective weight loss strategy there is. A lot of people struggle with weight loss, either hitting a plateau after a certain point or gaining back what they’ve lost. However, weight loss really can be approached one bite (or more to the point, one meal) at a time, through portion control. Other than endocrine disorders and other medical conditions which predispose a very small segment of the population towards being overweight, it’s really as simple as this: if you eat sensible portions of the right foods, you’re not likely to be overweight. If you take a look around you, you can tell that there are a lot of people who don’t do either, although that’s really all it takes. If you were to forget about whatever the latest diet plan is and just eat three meals a day, stopping when your hunger is satisfied and don’t snack, you’d probably reach your ideal weight in a year or less. Of course, there are some ifs there to contend with and that’s where the challenge comes in. The key to weight loss is controlling how much you eat, more so than what you eat (within reason). While it’s dismaying to see people having to resort to surgery when willpower could do the job just as well, gastric band and gastric bypass surgery essentially forces the patient to exercise portion control by making them feel full more quickly. While surgery should be a last resort, hypnotherapy programs which are designed to provide the same effect are a non-invasive alternative. Physically reducing the size of your stomach through surgery is a drastic measure, but of course, it does work since it makes eating less essentially your only option. Hypnosis, specifically what is known as lap band hypnosis, trains you to eat more slowly, enjoying each bite of your meals individually rather than shoveling it all down at top speed as many of us tend to do. Eating this way is better for your digestive system and just as importantly, it allows your nervous system the time it needs to send the message from your stomach to your brain to let you know that you’re full. When you eat too quickly, you may not get this message until you’ve already eaten far more than your fill rather than stopping when you’re satiated. We’ve all got a lot on our plate these days (no pun intended) and for most people, eating quickly has become a habit. However, by taking a few extra minutes for mealtimes, you’ll help yourself to lose weight as well as actually savoring your food – something a lot of us don’t give ourselves the opportunity to do very often. As important as portion control is, it isn’t the only part of losing weight. There are a lot of reasons why people overeat and in those whose eating is tied to emotional issues, hypnotherapy may be in order to come to terms with these issues before proceeding with portion control or other weight loss strategies. 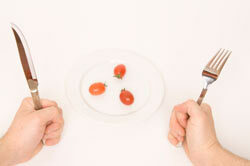 Eating slowly is at the core of successful weight loss and obesity treatment. However, if portion control is difficult for you at first, a course of virtual gastric band hypnotherapy can help you to learn how to eat in a way which promotes weight loss and better health; to paraphrase the old joke, one bite at a time. Portion control is a part of my private VGB program. Find more details about my Private Virtual Gastric Band Clinic here.